Honda Civics are one of my favourite cars. Actually they are my favourite because I have owned six of them. 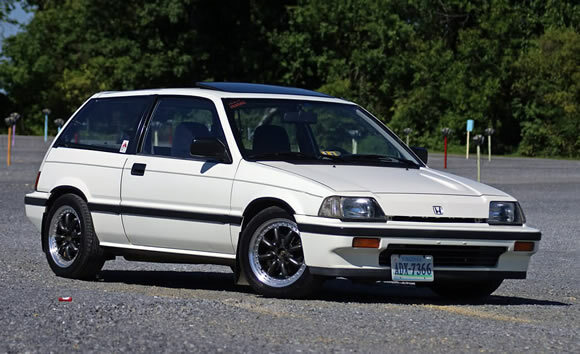 Three of them were 1986 hatches like this one, one was a 1988 Si hatch, one a 1989 Vtec hatch and the last a 1992 Si hatch. You can see a common thread here I'm sure. Fast, light, great handling cars that don't cost a lot to run. The Honda Civic gave me my only car claim to fame in NZ. Back in the mid 90's I turboed the first Honda in New Zealand. At the time I was driving one for a work wagon and building a 13B powered Datsun 1600SSS. When I sold the Datsun I turned my attention to my Honda and did the usual things to it: airfilter, exhaust, lightened flywheel, paddle clutch, suspension, etc. But turboing got my attention after reading some US and Japanese magazines. I purchased a book and got to learning because no one knew anything about turboing Honda's and a lot thought it was a waste of time. Well after I got it going, and only running 7psi boost, a lot of people changed their minds. Generally when I was wheel spinning past them in 3rd or 4th gear. I think these Honda's are future classics and I hope to one day have all the models I like. In the meantime I will feature them for your enjoyment. Let me know if you have ever driven a Honda Civic on our Facebook page - http://facebook.com/ilovecars.